Happy Monday! So who has two thumbs and doesn't want to work today? This girl! I had a pretty fantastic weekend and I am just not ready to be back working two gigs this week. Somehow I have to get my head back in the game. Am I the only one feeling the drag this morning? Probably doesn't help that I had a really fantastic weekend with my friends. Be prepared this is a picture heavy post today. I tried to narrow down but look how gorgeous! Friday night D and I picked up one of our friends and headed up to meet our other friends at the cabin. Some of them had been there before but not for a whole weekend. We also got babysitters for the kids so it was the first weekend away. I missed Reese, but it was totally necessary and worth it. We got up kind of late on Friday and by the time we unloaded it was dark. We headed up to the local bar for some drinks and games. I played pool and darts with my one friend and she hustled me! She was all "oh I am not good either" meanwhile 5 minutes later she kicks my tail. She isn't braggy about it, but dang! I am bad at pool, ha! Saturday was the big day. We all slept in. We especially didn't wake up our one couple friend so they could get one full night's rest. We ate breakfast and got moving. We really wanted to take them to Kettle Falls (hotel and water fall) because we thought they would love it. It's a bit of a boat ride out there so we headed there first. It was the smoothest ride we have ever had out there. One of the lakes, Namakan, is huge and things can change on a dime there so for a smooth ride it was rare and welcomed. We made it out there, had a couple of drinks showed them the falls and got back on the boat. Just in time to try and run from a storm. We got about halfway through Namakan before we realized that wasn't gonna work so we pulled off to a little-protected area and waited it out. Once it passed we got to show them our little beach spot before heading back in. There is a little resort called Voyagaire and we stopped there for dinner. The food there is pretty good and was really necessary after being out for most of the day. That night we headed back to the cabin, played a couple of games before passing out. It was a long day but an absolutely great day with friends. On Sunday we headed back home and picked up Reese from my parent's. Riggs desperately tried to cuddle with D in the car and I caught this moment. Is he ridiculous or what? For a weekend away like this, I have slowly but surely built my travel size beauty item inventory. 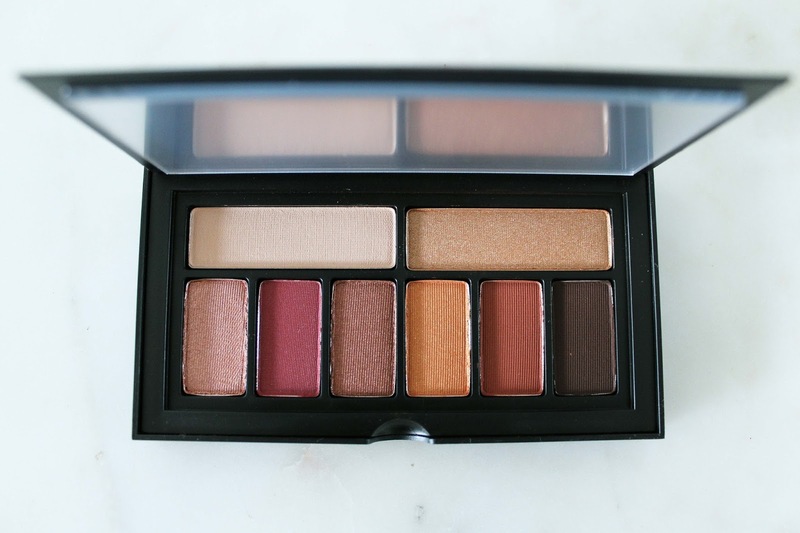 When picking up one of my items I spotted this Smashbox eyeshadow. I had vowed I wouldn't buy more palettes because I have more than I need but these colors were just gorgeous. Very desert hues and perfect for fall. It also happens to be compact so perfect for travel. I contacted my favorite beauty guru but she had not really used their shadows before. I tested a few on my hand and decided to take the risk. I am happy to report they are pretty great. Very pigmented and a little goes a long way. I made the mistake of not knowing this and I had to really blend in one of the colors. I am really into these colors and can't wait to play around some more. I also put together a few of my favorite travel sized beauty items. I am pretty high maintenance so I need all my things and thankfully the beauty industry has realized this. I particularly like the Biolage shampoo and conditioner. They are really inexpensive for what they are and you can get them in color protectant and one for volume, I think. I find using a good shampoo/conditioner is crucial and I am just not willing to sacrifice a cheaper brand while I am away. I also like the Living Proof dry shampoo. Not only does it reduce the need for showering up at the cabin, but it also doubles as a texturizing spray in a pinch. It is not as good as say, Drybar Triple Sec, but will suffice for a short trip. I also got a good hairspray and lotions are important too. Do you have any favorite travel sized beauty items? Would love to add to my collection.